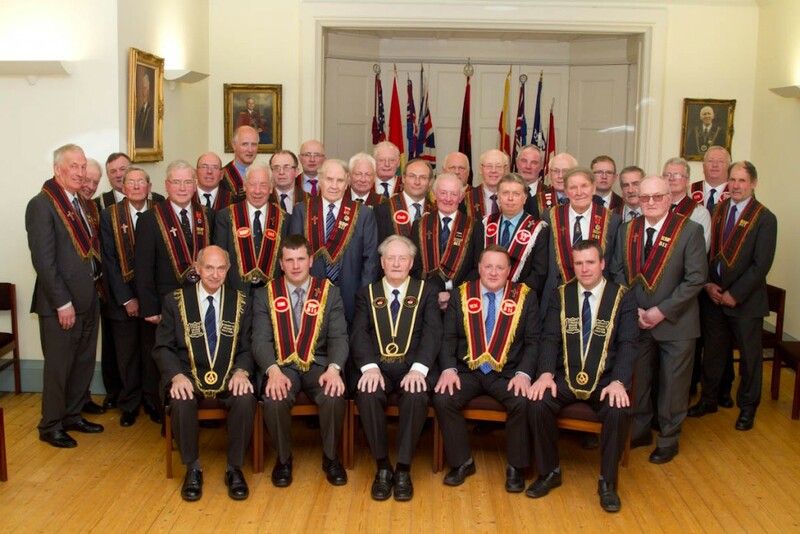 Killyman Temperance RBP 511 celebrated its 125th anniversary recently by having a meeting in the Cushnie Room of Brownlow House. The S.G.M. Sir Knight Millar Farr as present along with the C.G.M. Sir Knight Wm Abernethy and Sir Knights from or sister Preceptory Killyman Shield of Faith RBP 35. The Preceptory was formed in June 1890. It’s first WM was Sir Knight Rev E F Campbell, rector of Killyman Parish at that time. Sir Knight Rev Campbell was instrumental in setting up the Lord Enniskillen Memorial Orange Orphan’s Society which to this day continues to support widows and orphans of our institution. The first registrar was Sir Knight R D Greeves who held that office for almost sixty years. Sadly his grandson Sir Knight Eric Greeves was murdered leaving work in Armagh on 15th December 1972. From the initial roll two families remain until this day, that of Douglas and Gallagher. A grandnephew of the original Sir Knight George Douglas, Sir Knight Thomas Douglas is the present WM as he is assisted by Sir Knight Uel Eakin as DM. Three member Sir Knight’s David Blair, John Hadden and Neville Campbell have given over sixty years of service.